This series includes a wide range of projects including some constructed of WOODSTALK strawboard! 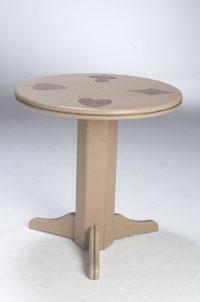 This exciting plant container incorporates jigsaw puzzle pieces with fiberboard made of wheat straw. The container is designed to store in a flat position by disengaging the puzzle lock that holds the planter together. Any liner can be used in the puzzle planter to display plants in the garden, patio or inside the house. Store the outside puzzle planter or leave the inside one together all year round. These containers can be produced in any size, colour, or shape. Make small ones for inside displays. Watch Bob and Rick make a pattern and produce a unique puzzle planter on the Router Workshop episode #1101. 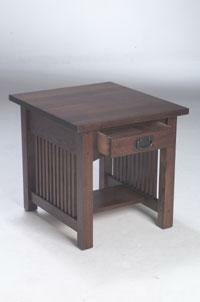 This pine and maple stool is designed with a swivel seat. Sturdy pine legs can be painted in a colour that will contrast with the clear maple seat. Watch Rick and Bob fashion a swivel stool on the Router Workshop episode #1102. Bob and Rick show the intricacies of the bent leg hall tree in the Router Workshop episode #1105. This oak hall tree uses simple lines and a routed knob to set off brass and ceramic coat hangers. Or follow instructions to make oak hangers to match the hall tree. A bottom shelf spreads the bent legs for strength and stability. Use it in any entrance to hang coats and hats with a minimum of wasted space. There is no place that requires storage more than the shop. 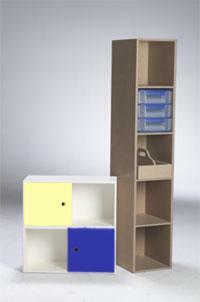 Numerous tools, hardware, and materials all require easy access and safe storage. Tool storage ideally should be designed to fit the tools etc. to be stored. Bob and Rick work up a tool storage design and show you how to build it out of fiberboard made of wheat straw. It can be painted or finished with a clear finish. Watch episode #1108 of the Router Workshop. 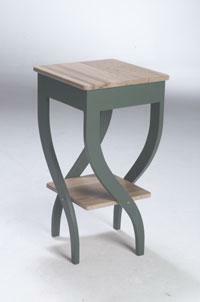 One beautifully designed swan neck leg is used four times in this unique stand. 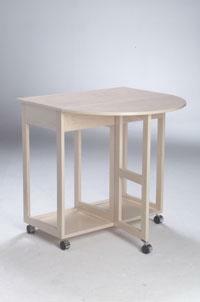 The trick is in the placement of the legs and the joinery to uphold the top. Plants, lamps or pictures can be displayed in that small, unfurnishable corner of any room in the house. Bob and Rick show you how to make the leg pattern and fashion this swan neck stand with your router on episode 1109 of the Router Workshop. The entrance area of our homes is usually untidy with scattered shoes. A solution to this problem is a shoe rack or maybe three or four (depending on how many shoes). On the Router Workshop episode #1110, Bob and Rick design and build a stacking shoe rack to fit every need. Make one or two or more and stack them to take advantage of the space available. Aromatic cedar provides an extra plus in dispensing a pleasing smell in the closet or entrance where the racks are used. Every shop and home needs at least two of these sturdy, stacking saw horses. The sloped legs give stability, the enclosed gables give strength, and a handy shelf-spanner separates the legs and stores small items and tools where they are easily accessible. Bob and Rick tell you not to paint or finish your pine horses because the paint will just come off on the project you are working on. Watch Bob and Rick on the Router Workshop and make your own shop horses.